Lauren C. Spooner is a doctoral student in clinical psychology at The University of Southern Mississippi with a primary research interest in the psychological care of women during and following childbirth. She would like to invite new mothers (women who are at least six weeks postpartum and have given birth within the last year) to participate in a research study designed to examine women’s perceptions of their labor and delivery experience and how these perceptions relate to postpartum functioning. 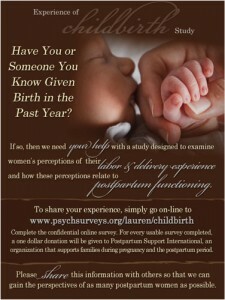 To participate in this study, new mothers can go online and complete an anonymous survey at https://www.psychsurveys.org/lauren/childbirth. For every usable survey completed, $1 will be donated to Postpartum Support International an organization that supports families during pregnancy and the postpartum period. For additional information about the study you can contact Lauren at spoonerwl@windstream.net.